This morning you’ll travel by minibus to Mt Nebo (approximately 1.5 hours). Mt Nebo is the spot where the prophet Moses is said to have seen the 'promised land' and is supposedly buried. Explore this sanctuary and view the remarkable mosaics of the 4th-century church. On a clear day, the views over the Dead Sea to Israel are spectacular. Then you’d better have brought your swim gear as you can wash of the dust from exploring with a dip like no other. Drive around 30 minutes to the shores of the Dead Sea, the lowest point on Earth (420 metres below sea level). This isn’t actually a sea but a super-salty lake (dead because of the lack of life in it) where the density of the water means you’ll go for a float, not a swim. Spend some time relaxing here and get some classic floating pictures. The mud here is supposed to have healing properties, so why not cover yourself from head to toe for a nutrient-rich natural mineral mud bath. Towels are available for hire. Make a stop at the impressive crusader castle of Kerak, which stands on a cliff, sheer on three sides, and commandingly overlooks Wadi Karak and the Dead Sea in the distance. You’ll have time to explore the evocative ruins – a seven level fortress, with many rooms and passaeways buried deep into the hill – and to discover the legends of the 12th-century battles between the Crusaders and the Muslim armies led by the Arab hero, Saladin. You’ll then continue on to Petra for the night (approximately 4.5 hours). Petra is justifiably on most people’s list of ‘must-visit’ places. It's the jewel of Jordan, the lost city of the biblical Nabateans, an impressive series of tombs and dwellings hidden behind ornate façades carved directly into the rock, and one of the new Seven Wonders of the World. Dating back to the 6th century BC, the site was lost to Western minds until it was rediscovered in 1812 by a Swiss explorer – he dressed up like a local to sneak in and then revealed the secret to everyone. Thankfully he did though, because this isn’t something you’d want to miss out on. Squeeze through a mile long narrow path, known as the Siq, through huge towers of rock and get your first glimpse of the iconic Treasury – it’s impossible not to imagine the armies and traders who made their way down here in the ancient times. It’s amazing to think that this awesome, intricate building entrance was hand carved out of the rock. The site is surprisingly big, and you can explore the old Roman road, temples and several old tombs, as well as the rock-hewn amphitheatre. In the afternoon, you have the opportunity to explore the rest of the site at your own pace. For those with the energy, there's the challenging but highly rewarding walk up the steps to the stunning Monastery (approximately 1 hour). Maybe seek out a Turkish bath for the perfect end to an incredible day. Notes: One day's entrance fee to Petra is included. Please note that when entering Petra as a group, a complimentary horse ride is included in the ticket price from the entrance point down to the Siq. Intrepid doesn't recommend that you take this option due to the safety and insurance liability involved. Follow in the footsteps of Lawrence of Arabia with a short drive (approximately 2 hours) to the extraordinary desert scenery of Wadi Rum, a rugged moonscape of huge sandstone mountains. A 4-hour jeep safari will take you through some of the most beautiful and sublime desert scenery on the planet, a true highlight of this trip. Wadi Rum is full of weird and beautiful lunar-like rock formations, and traces of ancient civilisations can be seen in the many carved inscriptions found throughout the area, from pictographs to Thamudic, Nabataean and Arabic texts. The most enduring monuments in Wadi Rum are those carved by nature – the natural rock bridges, towering rose-coloured sand dunes and scattered rocky peaks. Tonight you’ll sleep in a simple desert camp, with the choice of sleeping under a camel hair tent or out under the stars. Enjoy a delicious dinner cooked in an earthen oven by your Bedouin (which means ‘Desert Dwellers’ in Arabic) hosts. Conditions are basic at the desert camp, but the hospitality of your hosts is legendary, and you'll treasure the memory of sleeping beneath the twinkling desert night sky. Notes: A mattress and blankets are provided. Please be aware that while the desert may be very hot during the day, it will still be cool at night and warm clothes and a sleeping bag are highly recommended when travelling outside of the summer months. Western-style toilet facilities are available. This morning you’ll leave Wadi Rum and travel to Aqaba (approximately 1 hour) where you’ll board a ferry to cross the Gulf of Aqaba and continue your journey to Egypt (approximately 2 hours). Please note that you'll be travelling on this ferry unaccompanied by a group leader. Your Jordan leader will help you board the ferry and then bid you farewell. Please see the important notes section below for further details on the ferry crossing. You’ll be met by your Egyptian leader on arrival in Nuweiba, then travel by van to your Red Sea beach camp (approximately 30 minutes). This is a harsh and barren land of sprawling windswept plains and rugged mountains, but it's also home to some fantastic beaches. It’s like its Sinai neighbours, Dahab and Sharm el-Sheik, before mass tourism arrived. Thankfully, the camp is still a hidden gem for Intrepid groups. It's set on one of the few beautiful stretches of fine golden sand found along this coast, and is a place that you'll be raving about to your friends for years to come. You’ll stay in a simple but comfortable beach hut located right in front of the water. These huts are made from local palm trees and have two single beds, electricity, linen and mosquito nets (the toilets and showers are in a communal block). This morning after breakfast you’ll see some of the world’s most iconic sights. You’ll visit Giza’s Pyramids and Sphinx – instantly familiar yet retaining a mystique and power, getting up close to these incredible pharaonic tombs is amazing. Explore these structures that have stood tall for 4,500 years, and for an additional charge you may be able to go inside the Great Pyramid of Khufu (or Cheops), although occasionally it may be closed to visitors. Please note that you'll be required to walk around the Pyramids complex. It can be very hot in the summer months, so be prepared for little shade and pack appropriate clothing, sun protection, and carry lots of water. Afterwards, make your way to the Egyptian Museum (optional), home to one of the world's great collections of antiquities. Wander the treasure-filled halls of the museum, and make sure to check out the Mummies Hall (optional) for a close encounter with some of the country’s most important queens and pharaohs. Later in the evening, meet your leader and travel to Giza station, where you will board a sleeper train to Aswan (approximately 13 hours). Bedding and air-conditioning are provided. The Nile, Elephantine Island and white-sailed feluccas: welcome to Aswan, Egypt's southernmost city. Its easy-going charm is due in no small part to its large Nubian population. Today is a free day so take the opportunity to see such Aswan sites as the unfinished obelisk or the High Dam. The Nubian Bazaar is a must, while the excellent Nubian Museum is top of many visitors’ lists. Highly recommended is the beautiful Temple of Isis (the Goddess of health, marriage and wisdom) that was rescued from the rising waters of the Nile and relocated on Philae Island. It's a marvel of decorative pylons featuring some of Egypt's finest carvings – definitely one of the real gems of Upper Egypt. The waterfront promenade, or Aswan's 'corniche', runs alongside one of Nile's most appealing stretches and is the perfect place to stop for a mint tea. Watch the waterfront come alive at dusk, with families out strolling, socialising and relaxing along the corniche. Today perhaps head out of Aswan and visit stunning Abu Simbel this morning. With the four gargantuan statues of Ramses guarding the Great Temple, this is one of Egypt's most memorable sights. Please note this optional activity has a very early start (but it’s totally worth it) - departure will be between 5am and 6am. You can get there by flying, or by the cheaper option of renting a minivan with a group and leaving very early (flights do not operate daily). The journey by land is 3 hours each way. It's best to visit at sunrise to avoid the heat. The rest of the day is free for you to make your own discoveries. A popular afternoon option in Aswan is a sailboat ride around the islands in a traditional felucca, stopping off at the botanical gardens on Kitchener's Island. Alternatively, take a camel ride to the Monastery of St Simeon, an abandoned 7th-century fortress monastery located in the desert on the Nile's west bank. Your tour leader will be on hand to help you arrange any excursions. Alternatively, you may prefer to simply relax and take in the beauty of the Nile, or do some shopping in the friendly bazaar. This morning you’ll board an iconic traditional Egyptian sail boat board, a felucca, for a morning sail until lunch. After lunch aboard the felucca, arrive at a Nubian homestay on the West Bank of the Nile. Explore the Nubian way of life here with a walk through the surrounding countryside and agriculture fields to reach the homestay. The tranquillity of the location is indescribable. The house is in the Nubian style, with a sandy courtyard in the middle where the family gathers for meals, and to the sides are the rooms where they sleep. These are also the rooms that you’ll be staying in for the night. Get into the swing of Egyptian life by lending a hand in the kitchen to help cook dinner, or maybe kick around a football in the courtyard with the kids. There are few better ways to understand a country and its people than with a local homestay. After farewells to the felucca crew, take a private van to Luxor (approximately 3.5 hours). Today you’ll visit the Intrepid Foundation's local project ACE (Animal Care in Egypt). It’s a great chance to see the holistic approach the project takes towards animal welfare, and to raising awareness among the locals. 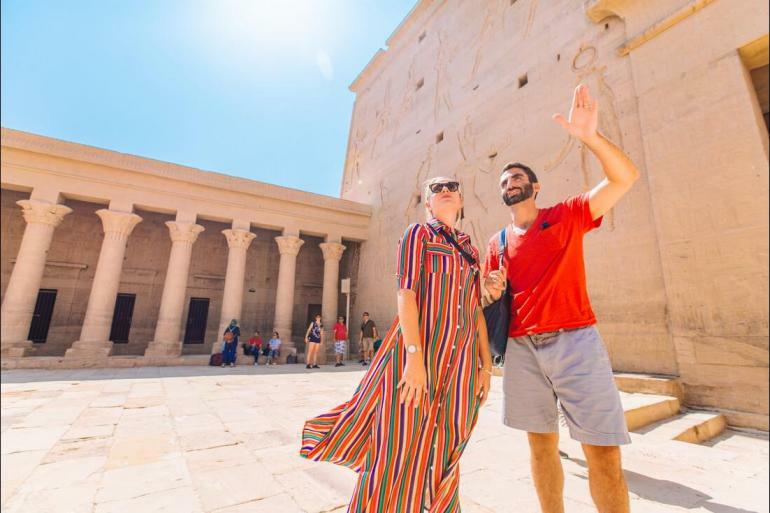 You’ll also explore the magnificent Karnak Temple, which is perhaps the most impressive of all the ancient Pharoahs' monumental works. One of the world's most celebrated temple complexes, Karnak is a house of the gods built over a period of some 200 years. 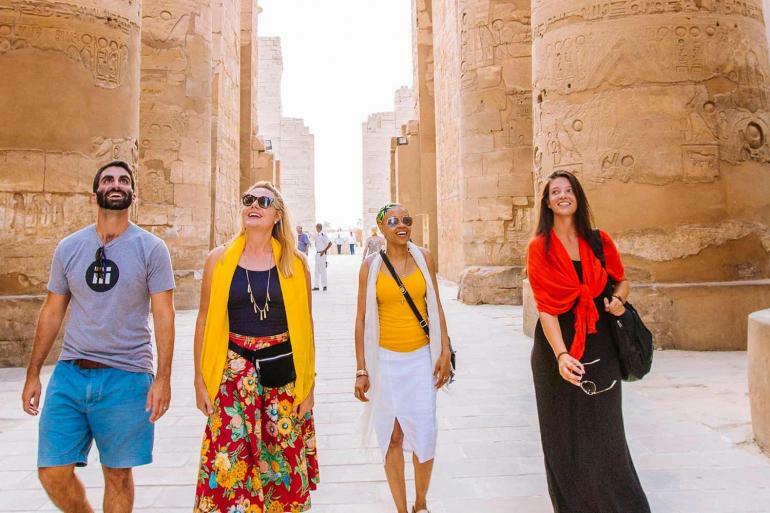 Your guided tour of this vast temple of impressive pylons, obelisks and chapels will reveal its finest sections, such as the Avenue of Sphinxes and the Great Temple of Amun. The rest of the day will be free to relax, shop in the bazaar (open until quite late) or perhaps experience the atmosphere of a local teahouse. Today you farewell the Nile and drive east to the beachside town of Hurghada (approximately 5 hours). The green Nile valley is soon left behind as you head out into the barren Eastern Desert. Passing through rocky hills, the glittering waters of the Red Sea soon come into view and the rugged bulk of the Sinai Peninsula looms through the haze on the opposite shore. A vibrant beach resort, Hurghada is by no means a typical ‘adventure destination’. After checking in to your hotel, take a walking tour with the leader to get your bearings, and check out some of the local restaurants and eateries. Check out of your hotel this morning and make the 6 hour journey back to Cairo by private bus. On your return to Cairo, visit the Islamic parts of the city and the frenetic backstreets of the local bazaar (Khan el-Khalili) with your trip leader. A labyrinth of narrow streets and passageways, Khan is one of the biggest and oldest markets in the world. The 'Khan', sprawling around an old area known as Al-Azhar, is a quintessentially Cairo experience – a warren of alleys with stalls serving up a succession of intoxicating scenes. It retains a distinctly medieval feel. You might explore the gold market, ‘Perfume Street’ and the spice market, where heady aromas hang in the air like a thick blanket of Damascene cloth (which can be purchased next door in the cloth market). Jump in a private van today and drive following the ‘desert road’ to the Mediterranean coastal city of Alexandria (approximately 3 hours). Egypt's second largest city and main port, locals call this vibrant city the Bride of the Mediterranean Sea. On arrival in Alexandria, take an orientation walking tour with your leader. The Greek architect Dinocrates built Alexandria in 331 BC under the orders of Alexander the Great. The city, immortalising Alexander's name, quickly flourished into a prominent cultural, intellectual, political and economic metropolis. It was the renowned capital of Ancient Egypt's last royal dynasty, the Ptolemies, and the site of the Pharos. One of the Seven Wonders of the Ancient World, this lighthouse acted as a beacon, guiding sailors away from this notoriously treacherous stretch of coastline. Take some time to stroll along the Corniche and take in some fresh Mediterranean air. Alexandria at night is not to missed, with the whole city lighting up. Today you’ll head back to a more recent period in Egyptian history with a visit to El Alamein and the war museum located there. El Alamein sits on the Mediterranean Sea, 106 kilometres west of Alexandria, and it played an important role in significant World War II battles. The area was a turning point in the North African campaign, where the Allies held out against, and eventually pushed back and defeated, the Afrika Korps of Rommel. The importance of El Alamein was highlighted by Winston Churchill, who said “Before Alamein we never had a victory. After Alamein, we never had a defeat.” The area contains a number of memorials from the countries who lost soldiers here – Greece, South Africa, Australia, Italy – as well as a war cemetery that’s home to the graves and names of the thousands who lost their lives, from places as diverse as Britain, India, Melanesia, Malaysia, and New Zealand. In the museum, discover the story of what unfolded here, and then return to Alexandria. The city is also known for its seafood, so don't forget to feast on some fresh fish while you're here. This morning, head underground and delve into the mysteries of the Kom ash-Shuqqafa catacombs. This Roman burial site is the largest of its kind in Egypt and was discovered, quite accidentally, by a hapless donkey. The crypts are 20 metres below street level, and what probably began as a small family tomb grew into a labyrinth of chambers that could accommodate more than 300 bodies. Murals and reliefs inside show how Alexandria was a place where Egyptian and Greek funerary myths coexisted. Stop by the strikingly modern Bibliotheca Alexandrina, inspired by the original great library of Alexandria and built to hold over 8 million books. Your last included visit today is el Morsi Abu El Abbas Mosque, the largest in the city. In any free time, perhaps take the opportunity to see the Citadel of Qaitbay, a fortress overlooking the Mediterranean Sea, where the famous lighthouse once stood. You’ll then leave Alexandria and return to Cairo (approximately 5 hours), arriving around 4 pm. The afternoon is yours to spend as you please. Take the chance to visit Khan Khalili for some last minute shopping in the evening. Then maybe gather together you fellow travellers for a celebratory kebab, kofta, or sheesha as this Egypt exploration comes to an end. Guides All Intrepid group trips are accompanied by one of our group leaders. The aim of the group leader is to take the hassle out of your travels and to help you have the best trip possible. Intrepid endeavours to provide the services of an experienced leader however, due to the seasonality of travel, rare situations may arise where your leader is new to a particular region or training other group leaders. Your leader will provide information on the places you are travelling through, offer suggestions for things to do and see, recommend great local eating venues and introduce you to our local friends. While not being guides in the traditional sense you can expect them to have a broad general knowledge of the places visited on the trip, including historical, cultural, religious and social aspects. At Intrepid we aim to support local guides who have specialised knowledge of the regions we visit. If you were interested in delving deeper into the local culture at a specific site or location then your leader can recommend a local guide service in most of the main destinations of your trip. On this trip you'll have the services of two different leaders: 1) From Amman to Aqaba, you'll have a Jordanian leader. - You'll travel unescorted from Aqaba to Nuweiba on the ferry (approx 2-4 hrs). 2) From Nuweiba to Cairo, you'll have an Egyptian leader.